Any fans of Hetalia out there? I'm a 14 year old furry obsessed with Hetalia, but no other furry I've been friends with likes Hetalia, anyone like Hetalia? Your average rolling boy here. Re: Any fans of Hetalia out there? I have watched the 1st and 2nd seasons, and watched the movie. I'm not really into anime, but I did like it. Like it because I am a really into history, and it puts a really funny spin on historical events! I have an slightly embarrassing love for Hetalia. Why do Spain and North Italy have to be so cute? I'm waiting for Ireland to come out! Grrrr, you guys just had to mention an anime show that I haven't watched yet! Over the Christmas break I watched the whole series and read some of the manga. Now I love hetalia... thanks guys thanks a lot. Hetalia's cool c: one of the few animes/mangas I actually know about, haha. Help please! I want cookies, if I don't have them I'll die of, cookie loss. I'm the Finland for my group ^w^, friends with a Prussia, Spain, Canada, China and the Narrator. Hoping to cosplay as Finland this year at a con ^w^. FFFF- YUS, I love me some Hetalia. I'm up to date with the anime (Beautiful world is beautiful indeed) and I'm working through bits of the manga, my friends and I hope to get around to cosplaying as well. 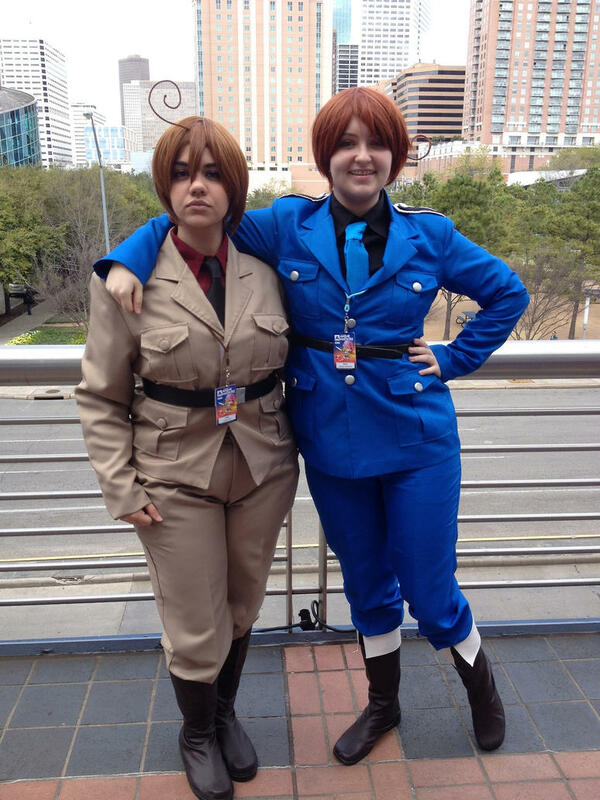 I plan to cosplay Switzerland, my BFF plans for Austria, and my other friend is leaning towards Romano. And favorite character? How can there be a favorite? I LOVE THEM ALL. I LOVE YOU HETALIAN FURS!!! I'm going to AnimeBoston as 2p!America, anyone joining me? Starting in 8th grade, I've been a Hetalian for like 4 years now. Ha, I was totally obsessed for the longest time. I haven't done much with Hetalia for a while, though I still cosplay as Japan, and I'm so excited about Beautiful World; the anime reboot that looks 100x better now that it actually resembles Himaruya's art style. "Forever 16 but not immortal"
Oh my, Sabie - you DO look fun, you and your friend! To my embarrassment I've never heard of Hetalia. Though I adore anime, at least the sweeater side of it. I also suggest checking it out sometime! It really is a cute anime-- it just kinda pokes fun at world history and the characters are absolutely charming. :3 I think it's on Netflix, too, if you have that. *kicks down door* Marukaite Chikyuu Marukaite Chikyuu Marukaite Chikyuu Boku Hetalia!